Faith -- Nothing Is Impossible With God! Despite of the danger, in faith, the whole nation of the Israelites circumcised. Then they remained in their places in the camp until they were healed. God saw their absolute faith, and said to Joshua, “Today I have rolled away the reproach of Egypt from you.” (Joshua 6:9a) God has removed the four hundred years reproach of Egypt, full of humiliation and hardship of the slavery. A new day was dawn in God, which was waited for many generations. The people of Israel were encamped at Gilgal, and they kept the Passover on the fourteenth day of the month in the evening on the plains of Jericho. And the day after the Passover, on that very day, they ate of the produce of the land, unleavened cakes and parched grain. And the manna ceased the day because there was no more needs for manna. They were already in the Promised Land, which was promised to Abraham. Finally, they started eating of the produce of the land. They ate of the fruit of the land of Canaan that year! The merciful God also sent the commander of His Army to Joshua. When Joshua was by Jericho. While pondering how to conquer Jericho, he lifted up his eyes and looked, and behold, a man was standing before him with his drawn sword in his hand. And Joshua went to him and said to him, “Are you for us, or for our adversaries?” And he said, “No; but I am the commander of the army of the LORD. Now I have come.” And Joshua fell on his face to the earth and worshiped and said to him, “What does my lord say to his servant?” And the commander of the LORD’s army said to Joshua, “Take off your sandals from your feet, for the place where you are standing is holy.” And Joshua did so. As He did to Moses, God poured His spirit on Joshua to be full of God’s spirit and courage. 1. March around the city once a day. Seven priests hold seven rams’ horns and blow the horns before the ark. The rest of the Israelite’s army follow the seven priests. 2. On the seventh day, circle seven times. Then the seven priests make a long blast with the rams’ horns. As hearing the sound of the long blast, all of the people shall shout with a great shout. 3. Then the wall of the city will fall down flat! No physical force would be needed, but before the sound of the Israelites, the wall will fall down. Yes, it would be very hard to believe what was told by God to anyone. However, Joshua was different. He believed although in his eyes, it was impossible. Joshua walked the walk with God for the last forty years. He experienced and knew who God was and what God could and would do. He again looked back the result of unbelief of the first generation. They all perished in the wilderness. The 1st generation Israelites saw the Promised Land, but they refused to go in because they were in fear. They saw the strong people and the fortified cities, and they believed their eyes more than the promised of God. They gave in the fear of the people in the Promised Land. How many times have we met this kind of situations? Initially we believed God and His promise, and diligently walked with God toward the promise. Everything went well. However, it did not continue long. Something unexpected came into our lives, and it is in the way of the joy of the walk with God, while becoming an unsurmountable impediment. We did everything to go around the impediment, but it did not work. The situation was getting worse without no sign of improvement. Suddenly fear, which was long forgotten found us, and entered into the deepest part of our heart, while paralyzing us. Yes, it is understandable why the 1st generation Israelites had complained to God. Even so, it was not what God wanted. Again, Joshua was different. Joshua pleased God. In faith, Joshua stood firm and tall. Joshua boldly said to the priests, “Take up the ark of the covenant and let seven priests bear seven trumpets of rams’ horns before the ark of the LORD.” And he said to the people of Israel, “Go forward. March around the city and let the armed men pass on before the ark of the LORD.” The new generation of the Israelites heard this command through their faith and believed. Yes, the faith of the new generation of Israelites was also great and firm. There was no question. They were obedient to the seemly nonsense God’s command. This was the faith that God really wanted, which truly pleased God. Then Joshua rose early in the morning, and the priests took up the ark of the LORD. And the seven priests bearing the seven trumpets of rams’ horns before the ark of the LORD walked on, and they blew the trumpets continually. And the armed men were walking before them, and the rear guard was walking after the ark of the LORD, while the trumpets blew continually. And the second day they marched around the city once, and returned into the camp. So they did for six days. Please imagine about the people in Jericho. How did they think when they saw the Israelites just circling the city wall. 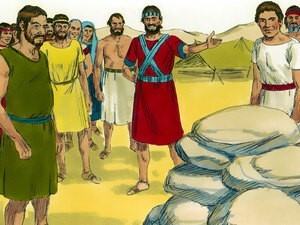 Initially, the people in Jericho were in a great fear because they heard about the Israelites. They expected a strong blow of the Israelites. Thus, they checked again and again the integrity of the city wall because it was the final protection against the Israelites’ invasion. As expected, the wall was strong ever. They thought that the wall was strong enough to protect against the Israelites’ attack. Only was the concern a siege that Israelites might erect against their city. However, strange enough, there was no sign of building a siege. The people of Israel were just walking around the wall. They just blew horns, and the rest of the Israel army just followed the seven who were blowing horns. It was odd that the leading horn blowers appeared to be non-military personnel, perhaps priests. They were not for any battle. They were just a bunch of people walking around the wall. Moreover, the people of Jericho could plainly see exactly the Israelites’ warfighters: who they are and what they have as their weapons. 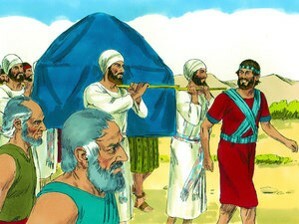 It was a stupid act to the eyes of the people of Jericho. Nobody showed off exactly all of their military personnel and the weapons that they would use. As a test, the people of Jericho shot a couple of arrows against the Israelites, but there was no retaliation at all. They just circled around the city following the wall. 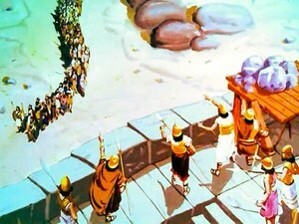 It was really absurd or even stupid how the Israelites behaved. This absurd and even funny scene was repeated for six day, but nothing happened. 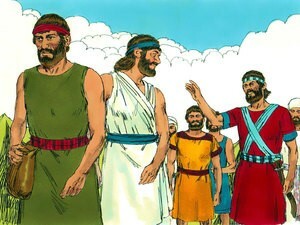 The Israelites circled once each day, and all of them quietly returned to their camp. On the seventh day they rose early, at the dawn of day, and marched around the city in the same manner seven times. It was only on that day that they marched around the city seven times. The people of Jericho saw a difference, but there was no sign of threat. The Israelites were still outside of the strong and fortified wall. And at the seventh time, when the priests had blown the trumpets, Joshua said to the people, “Shout, for the LORD has given you the city. And the city and all that is within it shall be devoted to the LORD for destruction.” (Joshua 6:16b, 17) So the trumpets were blown. 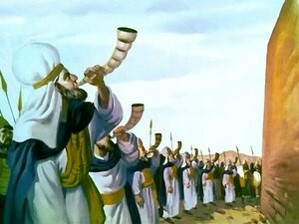 As soon as the people heard the sound of the trumpet, the people shouted a great shout. Initially nothing happened, but soon the wall fell down flat by itself as God told! Yes, before the faith, the wall fell down flat. It was not the might of the Israelites, but the God’s hand did bring down the wall, and made into a complete destruction, which was so strong that it defended against all enemies before for the Jericho. It was the symbol of the pride and security for the people of Jericho. But before God’s hand, it was nothing. It crumpled down at once. Yes, God was stronger and mightier. The people of Israelites believed, and God unleashed His power, which was manifested before the eyes of the Israelites. Please imagine the scene. The wall of Jericho, which reached the heaven and looked really strong and invincible, suddenly crumping down all together, making a thundering noise. What the Israelites did was just shouting. Then before their eyes, the strong and invincible wall was reducing down to a pile of broken wall-building materials. No stone was left on top of another stone. All were completely flattened. The Israelites looked each other, and they together saw the God’s mighty hand. Before God’s hand, nothing was impossible. The strong wall reaching the heaven was flatten in blinking of eyes. What God promised became a reality before their eyes. Their faith turned into a tangible thing that they could even stand on. All together in a single voice praised God and His greatness. So the people went up into the city, every man straight before him, and they captured the city. Then they devoted all in the city to destruction. The Israelites conquered the first city that they encountered as they entered in the Promised Land. It was a victory of their faith. They believed, and saw the God’s hand over the impossibility of conquering Jericho, which made the first generation in fear. In fact, which one did they believe? God and His promise, or what they saw and fear? The first generation did not believe, and they perished. Oh, God, please give us your faith that we can believe you and your promise before any impossibility. We are weak, but only through the grace and mercy of you, we can continue the walk given to us. We remember that the 2nd generation of the Israelites patiently obeyed your command. They circled seven days although they could see no sign that your promise would be fulfilled. They faithfully circled six days, and on the seventh day, they circled seven times as God commanded. Still there was no sign of God’s promise. When they shouted in faith as God commanded, the strong and invincible wall fell down. God, please give us faith to be able to endure to the end without giving up because we cannot see any sign with our eyes now. You were faithful to the Israelites, and your faithfulness to your children endures forever. We believe in you. Please continue guiding us through the paths of your righteousness till your will in us be done on earth as well as in heaven. Yes, we will praise your name in any circumstances. We will continue give thanks to you regardless what we see and touch, because you are infinitely good to us and faithful to us. Praise God for Your faithfulness to us, your children! Sing praise to You who is Our Ever Loving God. Amen! Faith -- How to Overcome Impossibility! So the men did as Joshua had commanded them. They took twelve stones from the middle of the Jordan River, one for each tribe, just as the LORD had told Joshua. They carried them to the place where they camped for the night and constructed the memorial there. 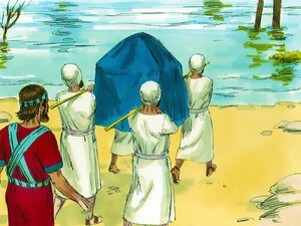 The LORD had said to Joshua, “Command the priests carrying the Ark of the Covenant to come up out of the riverbed.” So Joshua gave the command. As soon as the priests carrying the Ark of the LORD’s Covenant came up out of the riverbed and their feet were on high ground, the water of the Jordan returned and overflowed its banks as before. The people crossed the Jordan on the tenth day of the first month. Then they camped at Gilgal, just east of Jericho. It was there at Gilgal that Joshua piled up the twelve stones taken from the Jordan River. Yes, God was with Joshua, truly faithful to God, and the new generation of Israelites, who trusted God wholeheartedly not like the first generation getting out of Egypt. The first generation of Israelites actually saw the Promised Land, but they were immediately scared about the strong people who were already living in the Promised Land, and the fortified cities. They should have trusted God and His promise instead of their rationale. Instead, they looked at themselves, and compared with the strong people in the land. Then they immediately knew that it was impossible to possess the Promised Land. Yes, it was impossible for the bunch of ex-slaves to drive away the stronger people and conquer the fortified cities. Suddenly fear came into their hearts and minds. Since then, they were driven by the fear. In fear, they concluded that they could not go into the Promised Land. They blamed God for not being able to get into the Promised Land. Many of them questioned, “Why did God bring us here? Just showing the Promised Land without really giving it us to possess it?” They were very sad too, because they believed the God’s promise for generations. When they had a hard time under Egyptian oppression because they were slaves, this promise made them go. That night, they got together and talked about God’s promise – God would lead them to the Promised Land. They encouraged each other while relying on the hope that they would eventually go into the Promised Land, a land flowing with milk and honey. Finally, they arrived at the Promised Land, but it was not what they expected. The strong people and the fortified cities in the land was unsurmountable obstacles. It was impossible to push out the strong people in the land, and occupy the land. In short, the promise of God that they put all of their hopes was turned out to be nothing. It was an empty promise, and they harshly complained to God. Was it true? The answer is absolute not! Even so, the old generation believed what they saw with their own eyes more than God’s promise, which was not visible to their eyes. However, the new generation was different. They believed what God promised. Remember that they marched toward the impossibility -- the overflowing Jordan River in the harvest season. Before the impossibility, they wholeheartedly trusted God, and believed His promise. Out of their faith, they were able to experience the mighty God’s hand and the miracle that stopped the overflowing Jordan River, and they walked on the dry land to the other side of Jordan River. The new generation proved their faith, not like the old generation who failed miserably. In fact, God was about to fulfill His promise given to them generations ago. Yes, the new generation of Israelites was ready. God is always faithful to those who are faithful. Faithfulness does not come easy. Our eyes and brains tell a different story, “That’s impossible. It will never happen. You must be crazy.” Yes, it is impossible if we only rely on our own might, strength and wisdom. We don’t have to blame ourselves. It is natural. Any human beings would respond in the same way. Then what’s the answer? We need to absolutely surrender to God and His will. We need to trust Him no matter what happens to us. When all the Amorite kings west of the Jordan and all the Canaanite kings who lived along the Mediterranean coast heard how the LORD had dried up the Jordan River so the people of Israel could cross, they lost heart and were paralyzed with fear because of them. This is the secret of God. For those faithful Israelites, God had already prepared. 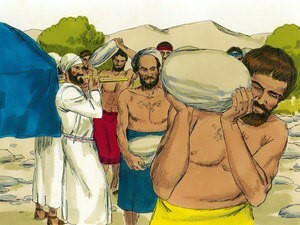 Although the people in the Promised Land looked much stronger than the Israelites, it was not true. God already put fear in the hearts of the kings in the west side of the Jordan River. How? God made them hear that God had dried up the overflowing Jordan River during the harvest season. God stopped the overflowing Jordan River, and let the Israelites walk on the dry land to reach the other side of the Jordan River. All of the kings in the Promised Land believed that the overflowing Jordan River would block the Israelites’ progress by being a barrier to their land. This thought was false. The almighty God dried up the Jordan River, the Israelites were marching through the river as if they were walking on a dry land, and they were already into their territory. The kings knew the Israelites were unstoppable, because the almighty God was with the Israelites. The Israelites also realized that the mighty hand of God was with them and He made a way before them. They were mentally and spiritually ready to conquer the Promised Land. Suddenly God told Joshua, “Make flint knives and circumcise this second generation of Israelites.” Why did God suddenly command Joshua to circumcise the new generation of Israelites? The first generation who left Egypt had all been circumcised, but none of those born after the Exodus, during the years in the wilderness, had been circumcised. The Israelites had traveled in the wilderness for forty years until all the men who were old enough to fight in battle when they left Egypt had died. For they had disobeyed the LORD, and the LORD vowed he would not let them enter the land he had sworn to give us—a land flowing with milk and honey. So Joshua made flint knives and circumcised the entire male population of Israel at Gibeath-haaraloth. After all the males had been circumcised, they rested in the camp until they were healed. Joshua faithfully obeyed God’s command. Yes, faithfully! Please note that at that time, Joshua were in the territory of the kings on the west side of Jordan River. That is, they were in the middle of the enemy’s territory. Who would really circumcise under such a dangerous situation? After circumcisions, they had to wait till being healed. During this period, they were really vulnerable. If any of the kings had known this fact, they would not lose the prime opportunity to defeat the Israelites and completely wiped them out to eliminate any future problems caused by the Israelites. Nobody with a right mind would perform circumcision, but Joshua did with the entire Israelites. They did not ask nor argued with God. They quietly obeyed the entirety of the God’s command. The Israelites completely trusted in God and His promise over their own reasoning. God saw their trust in God by absolutely surrendering to God while risking everything including their own lives in the most critical time and in the most dangerous place, i.e., in the enemy territory. Then the LORD said to Joshua, “Today I have rolled away the shame of your slavery in Egypt.” (Joshua 5:9a) The almighty omnipotent God announced that God had removed the four hundred years’ shame of slavery in Egypt on that day that the entire Israelites obeyed the God’s command without any doubt but only their complete trust in Him. God always waits for our whole trust in Him and His promise although our eyes and brains might tell a different story of impossibility, “You have already tried before, and it did not worked. It was impossible and it is still true. What’s different for this time? No rationally minded people would do because it is ridiculous. How in the world do you really want to follow God? Even you don’t know where you are going.” Yes, we will hear lots of voices when we try to obey God’s command and keep His promise wholeheartedly. If this happen to us, then think this is truly natural to all, not just us. What really happens here is that there is a war in our heart between ourselves and faith. Yes, our inner war between ourselves and faith in God is the very evidence that we have faith in God. If we just do what is rational to our eyes, then where is the faith in God? Sure, the fight is not easy. Resisting against ourselves and our own sinful desires is very difficult. If we experience this difficulty, please note that this is common to all believers. For example, Apostle Paul struggled, who had a far superior faith in God than us. Thus, don’t be dismay. We all believers want to follow God regardless what we see and know in faith, but our own self always war against us trying to hostage us not to follow God, but ourselves. By the way, if we fight this temptation with our own might and strength, we have already lost. The power of the temptation is too strong to us. (Just a little bit stronger than our might.) Then what shall we do? As Apostle Paul said, the answer is the Jesus Christ, Our Lord. Only by the power of Jesus Christ, who dearly love us by giving up Himself on the cross for our sins, we can overcome. Yes, the victory is sure in Jesus Christ. Praise God, and give thanks to Jesus Christ, who strengthens us to overcome all things in faith! Early the next morning Joshua and all the Israelites left Acacia Grovea, where they camped while they sent two spies. They arrived at the banks of the Jordan River, where they camped before crossing. 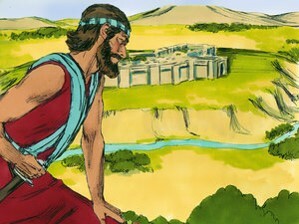 For three days, Joshua with the Israelites stayed to prepare their entrance to the Promised Land, which was the other side of the Jordan River. All of them were really excited. They could not believe they arrived at the Promised Land. Only were a few steps to take the cross the Jordan River. Then they would actually be in the Promised Land while standing with their own feet on the Land, which had been promised for many generations before. They also knew what had happened to their parent generation. They did not believe the promise of God and complained to God, when they heard their ten spies’ report about the strong people, the fortified cities and the giants. Especially, they heard about the legendry giants, whom nobody could defeat. Rationally speaking, it was impossible to take the Promised Land due to the people already in the Land. In fact, it was almost literally suicidal to go into the Promised Land. In fear, the people of Israel carefully listened to the report of the ten spies, although the rest two spies out of the twelve voiced up their belief in the God’s promised despite of the visible impossibility. God, then, pulled back them into the wilderness for the next thirty nine years till the unbelieving and rebellious generation completely perished in the wilderness. Yes, the people of Israel at the bank of the Jordan River saw their parents, uncles and aunts perished in the wilderness with their own eyes. They saw the consequences of unbelief. 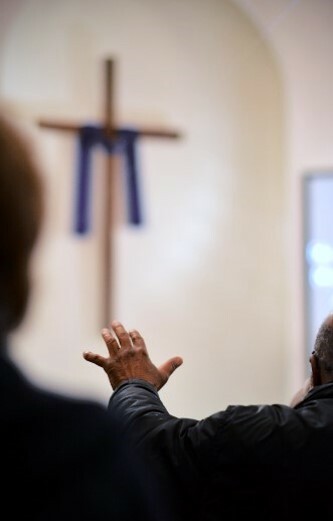 For three days, all talked about what had happened, and what they would do – faithfully following God and truly believing the God’s promise under any circumstances. 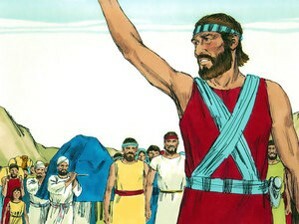 Three days later Joshua saw the entire Israelites were ready before God. 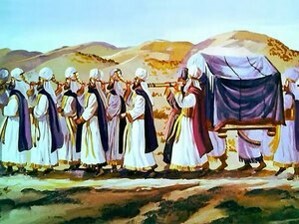 He mobilized the Israelite officers to go through the camp, giving these instructions to the people: “When you see the Levitical priests carrying the Ark of the Covenant of the LORD your God, move out from your positions and follow them. Since you have never traveled this way before, they will guide you. Stay about a half mile behind them, keeping a clear distance between you and the Ark. Make sure you don’t come any closer.” Joshua learned for the last forty years what was the most important: faith in God and having a complete trust in Him while believing the promise of God without any doubts. Joshua knew who the true leader was, which was not Joshua, himself, but God. Joshua humbled himself before God with the entire Israelites. He put God in front by making the Levitical priests to carry the Ark of the Covenant of the God, who faithfully followed. In his heart, he could see the presence of God in front of the formation of the Israelites although they had not made the formation yet. Joshua always dreamed about God who led the Israelites into the Promised Land. Yes, nobody but God was at the front. The mighty hand of God was leading the people of Israel, and the Israelites followed like sheep of a good and faithful shepherd. Joshua stoop up before the entire Israelites. Everyone’s eyes fixated on Joshua. Joshua looked around the countlessly many people of Israel who covered the entire area of the east side of the Jordan River bank. The people were able to see Joshua, who had been always faithful under any circumstances for the last forty years, and even his face was radiating in his faith. At one glance of Joshua, they knew Joshua truly believed the God’s promise absolutely and without any doubts. Joshua and the Israelites saw together the faith in God each other, and together they slowly scanned the Promised Land with their own eyes on the other side of the Jordan River. Then Joshua told the people, “Purify yourselves, for tomorrow the LORD will do great wonders among you.” Joshua encouraged them they would surely see the power and great wonders of God, and ask them to purify themselves by separating them from sins. In the morning Joshua said to the priests, “Lift up the Ark of the Covenant and lead the people across the river.” Following Joshua’s command, the priests started out and went ahead of the people. Then the people followed. It was the harvest season, and the Jordan was overflowing its banks. The river was deep and the water was fast. Anything dropped into the river would be immediately swept away with the strong flow of the river. Even so, nobody questioned about the command given by Joshua. Like Joshua, they also firmly believed the God’s promised without any doubts. The priests were leading the entire Israelites with the Ark of the Covenant of God, and the entire Israelites were following them toward the Jordan River overflowing because it was the harvest season. Please try to picture in your mind what the scene would be really like. The Israelites were blindly walking toward the overflowing river. To anybody with a rational mind, it must have had been completely absurd. For a third person, they were essentially suicidal. They were literally walk into (i.e., jumping into) the overflowing river. Soon they would be swept away by the dangerously fast moving water body of the river. Even so, no single complaint was heard, which was a stark contrast with what their parent generation did to God. The new generation of Israelites knew who God was, and absolutely believed God. Their faith was bigger than what they saw, touched and heard, which was what God wanted. And it is impossible to please God without faith. Anyone who wants to come to him must believe that God exists and that he rewards those who sincerely seek him. (Hebrews 11:6) Yes, their faith was strong, which pleased God. God told Joshua, “Today I will begin to make you a great leader in the eyes of all the Israelites. They will know that I am with you, just as I was with Moses. Give this command to the priests who carry the Ark of the Covenant: ‘When you reach the banks of the Jordan River, take a few steps into the river and stop there.’” (Joshua 3:8) Joshua believed. He did not question about the God’s command. 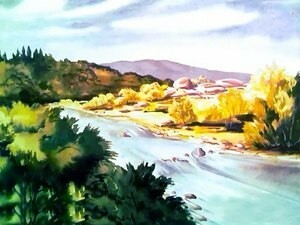 God told Joshua continued marching into the overflowing Jordan River without stopping or hesitation. Joshua immediately called his people to share what God told to him. Joshua did not test whether the flow of water would really stop or not. However, he had an absolute trust in the God’s word. As the God’s leader, he encouraged the entire Israelites to follow the God’s word. Yes, what God told Joshua was irrationally absurd. Joshua faithfully followed God regardless this uncertain future as Abraham, the forefather of our faith, did. It was by faith that Abraham obeyed when God called him to leave home and go to another land that God would give him as his inheritance. He went without knowing where he was going. (Hebrews 11:8) Abraham believed and he left his home land without knowledge of the future except faith in God and His promise. This faith made him as the father of our faith. So the people continued to marching toward the Jordan River, and the priests who were carrying the Ark of the Covenant went ahead of them. The priests absolutely believed and walked into the river. But as soon as the feet of the priests who were carrying the Ark touched the water at the river’s edge, the water stopped! The water above that point began backed up a great distance away at a town called Adam, which is near Zarethan because the Jordan River was overflowing during the harvest season. And the water below that point flowed on to the Dead Sea until the riverbed was dry. Then all the people crossed over near the town of Jericho. 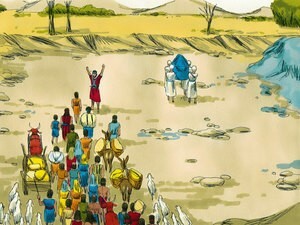 Meanwhile, the priests who were carrying the Ark of the LORD’s Covenant stood on dry ground in the middle of the riverbed as the people passed by. They waited there until the whole nation of Israel had crossed the Jordan on dry ground. This is the power of faith. Without faith, it is impossible to please God. Do we really believe the power of God? What God Wants - Our Absolute Faith in Him and His Promise! After forty years in the wilderness, Joshua returned the same place where he was sent as one of the twelve spies to explore the Promised Land, which was given to the people of Israel centuries ago through their forefathers – Abraham, Isaac, and Jacob. They explored the Promised Land, which was really good to their eyes. However, their eyes also saw the strong people, the fortified cities, and the giants, whom nobody had ever defeated. Their hearts melt. As they return, the majority of the spies (exactly ten of the twelve) reported the goodness of the Promised Land, but they added that they would never be able to get into and occupy the Promised Land because of the strong people, the fortified cities and the fearful giants. Although Joshua and Caleb, the minorities of the spies, insisted that as God promised, God would give to the people of Israel. Their voices did not fall into the ears of the people of Israel. 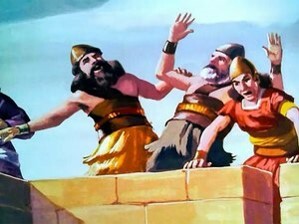 They complained to God, and they even tried to stone Joshua and Caleb. God rescued Joshua and Caleb, and told the rebellious people of Israel because of their unbelief, none of them would go into the Promised Land. Then God sent them back to the wilderness for another thirty nine years. Joshua, who was faithful, now stood tall and strong in faith before God and the people of Israel. 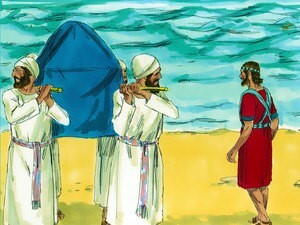 Joshua was no longer an assistant to Moses. Instead, he was the lead of the entire Israelites. (Even Moses could not make to the Promised Land. 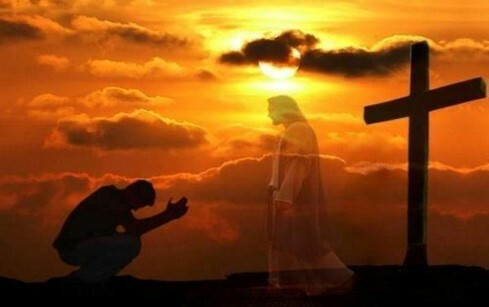 Once he doubted God and His power.) Joshua truly believed God before the impossibility at which he confronted thirty nine years ago when he was sent as a spy to explore the Promised Land. Joshua vividly remembered the strong people, the giants, and the fortified cities, while the Israelites were a just bunch of ex-slaves without any formal military training. Logically speaking, there was absolutely no chance for them to go into and occupy the Promised Land. That’s why they did not believe God's promise. Joshua had never forgotten the painful moment that the entire Israelites had to move back to the wilderness. The same day could have had been a glorious moment of getting into the Promised Land. For the next thirty nine years, he saw the ten spies dying one by one in the wilderness. He also saw the entire generation of Israelites was slowly perishing on the wilderness. Some of them were his dear friends, and even family members. He also felt fear and even tasted whenever a close friend and family member died on the wilderness. But he fixed his eyes on God and His promise, and continued his journey given to him. When he looked back, Joshua realized that his faith in God and hope in God's promise made him continue the painful and difficult journey. Joshua picked two spies from the Israelite camp at Acacia Grove. Joshua avoided the past mistake of sending the twelve spies by selecting one from each of the twelve tribes. It was a really logical and rational way to recruit spies by representing the entire twelve tribes of Israelites. However, this wisdom backfired. All of the spies did not have an absolute faith in God and His promise. Surprising to Joshua and Cable, ten of the twelves were more rational people than being faithful to God. They were quick to speak rational words and provided a solution packed with an earthly wisdom. It was a simply disaster. For this time, Joshua came to God first, and prayed. Then Joshua hand-picked two spies who were truly faithful and filled with God’s spirit. 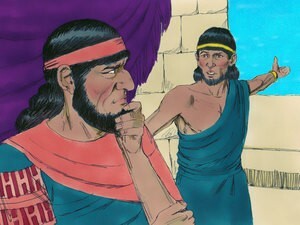 Before sending the two spies, Joshua prayed together. Then he carefully instructed them, “Scout out the land on the other side of the Jordan River, especially around Jericho.” Jericho was the first city that they would confront as soon as crossing the Jordan river to get into the Promised Land. It was also known to be one of the most fortified cities in the land. 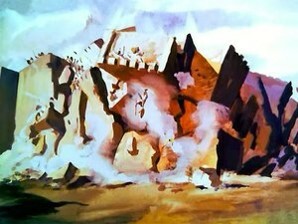 The first battle against Jericho was critical. Joshua had to win the battle. There was no option. While Joshua was praying, God gave him peace in his heart. 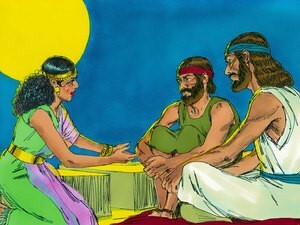 Joshua shared the peace of God with the two spies. So the two men set out at night secretly. They approached to the wall of Jericho, and climbed up quickly and quietly. Then he slip into the city. They tried to mingle with the people in the city. However, it was more difficult than what they thought. 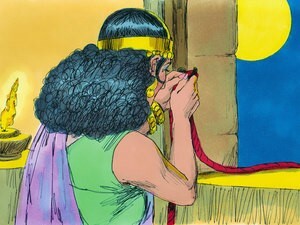 Soon they were spotted by the people in Jericho, and warned, “Israelties are in our city.” The two spies had to run. As came to the house of Rahab and they decided to stay there that night. Rahab surprisingly welcomed them. It was not long before someone, who spotted the two spies, told the king of Jericho, “Some Israelites have come here tonight to spy out the land.” The king was terrified. He heard about what God did for the Israelites. God sent down the plagues on Egypt to free the Israelties although the Pharaoh, the Egyptian king, who did not wanted to free them, sent them out of Egypt. Once Rahab heard about God, His might acts, and His people, and she pondered about the mighty God. She wanted to know more about the God. When she saw the two spies running into her place, first in fear of God, Rahab accepted them. Then she replied to the king's men, “Yes, the men were here earlier, but I didn’t know where they were from. They left the town at dusk, as the gates were about to close. I don’t know where they went. If you hurry, you can probably catch up with them.” (Actually, she had taken them up to the roof and hidden them beneath bundles of flax she had laid out.) So the king’s men went looking for the spies along the road leading to the shallow crossings of the Jordan River. And as soon as the king’s men had left, the gate of Jericho was shut. “Now swear to me by the LORD that you will be kind to me and my family since I have helped you. Give me some guarantee that when Jericho is conquered, you will let me live, along with my father and mother, my brothers and sisters, and all their families.” Rahab truly believed the God of Israel would decided to destroy Jericho to fulfill His promise. “I accept your terms,” she replied. And she sent them on their way, leaving the scarlet rope hanging from the window. The spies went up into the hill country and stayed there three days. The men who were chasing them searched everywhere along the road, but they finally returned without success. Then the two spies came down from the hill country, crossed the Jordan River, and reported to Joshua all that had happened to them. “The LORD has given us the whole land,” they said, “for all the people in the land are terrified of us.” (Joshua 2:23b) God already prepared the Promised Land even before the Israelties got into the land. It was not just a promise, but the people in Jericho made a confession on God’s plan to give Jericho to the Israelites. Yes, God had already prepared for the faithful Joshua and for the new generation of the Israelites, who never complained to God, not like the old generation who opposed to get into the Promised Land because they believed more what was seen their eyes than God's promise, which was not visible. God wants our faith, an absolute faith in Him and His promise. Yes, our eyes cannot see His promise right away. Often our brain tells a different story: our enemies are too strong, completely fortified, and even giants, who have never been defeated. Of course, with our own might, we will surely be defeated, because our enemies are stronger than us. However, when we truly and completely believe in Him, everything changes. Why? The battle no longer belongs us, but God. 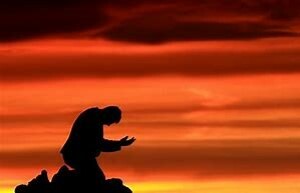 Our God, then fight for us, who created heaven and earth, and has been governing his creation since the creation. We need an absolute faith in Him. If not, we, ourselves, will be automatically in the way between God and the enemies. We block His true might and power. 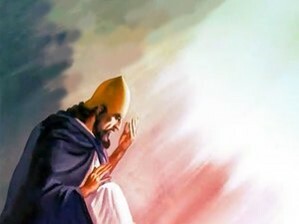 Let’s look at Joshua, who believed God and His promise before the impossibility and continued believing His promise for the next thirty nine years. Yes, it was really a long period. For thirty nine years, he could not see anything that gave out any hint that God’s promise was on the way. Even so, he always believed that God’s promise would be fulfilled. Finally, the God’s time came, and God made all things changed all together: the entire Israelites believed like Joshua, which was completely opposite to what he experienced thirty nine years ago. Second, the people of Jericho also told the exactly same fate that God would destroy Jericho and give to the Israelites, His chosen people. Third, God made the king of Jericho terrified. Even Rahab, a lowly person in Jericho, repeated the same promise of God given to His chosen people! What is the reality now? The same God is with us, who was with Joshua. Only wants God from us is an absolute faith in Him. God has already prepared for us, and is waiting for us. Our God is the omnipotent God, who is infinitely faithful to His people. Praise Him, who is worthy of our highest praises. His name be praised from now and forever!